What low self esteem signs should you look out for to determine whether you are suffering from low self esteem? A lot of people suffer from low self esteem without even knowing, some may even try to suppress their low self esteem while others live in denial altogether. The following are some of the most common signs of low self esteem and what you can do if you spot any of these signs in your own life. 1. Feel incapable - One of the tell tale signs of lack of self esteem is when you feel incapable, you lack the confidence and belief that you can achieve the things you really want and you always talk yourself out of trying, you almost write yourself off before you've even given it a shot because you don't believe you can do it. One of the ways to change this is to just go for the things you want, put your what if's and excuses aside and just go for it, and I mean really go for it! with focus and determination. Like my wife says "With hard work and determination, any goal can be achieved" and like Action Jackson always says "No more excuses, make it happen"
2. Feel unlovable - Another one of the low self esteem signs is feeling like you are not worthy of love. Causes of low self esteem such as physical disability or physical defects (such as skin conditions), or even past relationship heartbreak and failures can often leave people feeling unlovable. As a result you can end up feeling like, no one will ever like me or no one will ever love me or want me. The key to overcoming this feeling is to take your focus off what you think is the reason why you are unlovable; the chances are it's all in your mind. I used to feel unlovable due to a skin condition I had on my scalp, I didn't think any woman could want me let alone love me with such a condition, then I met my wife and she hardly noticed it, it didn't bother her one bit. It was all in my head but I had focused on the condition so much that it became the only thing I saw, and as a result it had magnified in my mind, appearing actually worse than it really was. Change your focus, you are worthy and deserving of love. 3. Negative self talk - Another of the symptoms of low self esteem is negative self talk, always talking down at yourself, always telling yourself you can't do it, always criticising yourself and putting yourself down. When you do that, it shows that you don't think much of yourself; it shows that you don't see yourself as a worthy and valuable person. The thing is, the more you engage in negative self talk the worse you will feel because you keep reaffirming the negativity and now you've conditioned your mind to be negative. To change this you need to change your negative self talk to positive self talk and recondition your mind to think and feel positive. The Changing my self-talk self esteem activity will help you achieve this. 4. Don't feel as good as other people - Comparing yourself with others and feeling like you are not as good as other people is another one of the low self esteem signs. It is very dangerous to judge yourself based on what other people are doing. It is easy to fall into that trap especially when your friends and peers seem to be achieving more than you. Maybe they are married and you are still single, maybe they've bought a house and you're still renting, maybe they're doing well financially and you're not doing too well in that area. If you begin to judge your life by theirs, you will start to feel like life is against you and begin to question and doubt yourself. Never measure your life by what others are doing or have done, we are not all the same, some people are sprinters others are marathon runners but each have their place and value and each are perfect for their task. Because you haven't yet arrived doesn't mean you never will, you might be a long distance runner while they are sprinters - you are not in the same race! so stop comparing. 5. Seek to be validated and approved by others - If you need people to always validate you and approve you before you feel good about yourself, then you are displaying one of the low self esteem signs. What this indicates is that you are dependent on the opinions of people to have self worth and your acceptance of yourself is tied to people liking and accepting you. This is dangerous because you have put your ability to be happy and fulfilled at the mercy of other people, it means that if they never validate you then you never feel good about yourself, it also means that if they criticise you, you self-worth will be shattered because you are at the mercy of their opinion. To change this you must take back your power! Don't wait until someone accepts you or says something nice to you before you feel good about yourself and feel like you are worth something. You are all that :o) even if nobody ever tells you that you are. Don't let people define you, give yourself the definition you want. 6. Unable to handle failure - Another one of the low self esteem signs is that you are unable to handle failure and setbacks very well, and you always associate the failure with you as a person rather than just seeing the event as what failed. As a result you begin to doubt your ability, lose confidence, and become afraid of trying things because you now see yourself as someone who never succeeds at anything. Overcoming low self esteem in this area will require you to disassociate yourself from the failure, what I mean by that is, you have to see failure as an event and not the person. Because you failed at something doesn't make you as a person a failure, it just makes that particular thing or event a failure, but you as an individual can still succeed at other things. 7. Blame others instead of taking responsibility - pushing the blame on others rather than accepting responsibility when things go wrong is one of the low self esteem signs. It takes a big person to put their hand up and admit when they are wrong, it takes a person with a positive self esteem to know that even when they are wrong, it doesn't make them any less of a person or take away from their competence. People with low self esteem on the other hand believe that admitting you got it wrong means that you lack ability and competence so they push the blame of others, pushing the blame is actually a sign of weakness. Accepting responsibility shows that you are willing to acknowledge what's gone wrong, learn from it, change and improve, that's why those who take responsibility succeed. 8. Lack of motivation and drive to do things - When you have low self esteem, you lose the motivation and drive to go for the things you want in life because you stop believing in your ability to achieve them. Maybe you've had a few failures and setbacks and things haven't worked out the way you planned or things are taking longer than you expected and you are now discouraged and feel like giving up and quitting because you've lost your zeal, enthusiasm, motivation and passion. Don't let your dream die, don't give up on your goals, don't let the fact that you haven't yet achieved it make you feel like a failure, don't let it make you quit, don't let it make you feel like nothing ever works out for you. Rather develop a dogged determination to keep going until you accomplish your goal. Attending a self esteem workshop or event will also help you get back your motivation and spark. 9. 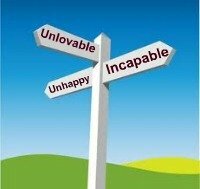 Unhappy with life and feeling like your life is going nowhere - One of the big give away low self esteem signs is when you feel unhappy with your life. You take a look at your life and it just feels like you are not making progress, everything just feels stagnant and you can't see the future getting any better. You are not where you want to be, you are probably in a job that isn't really fulfilling and the job feels dead-end, a relationship that isn't going anywhere, finances are not where you want them to be, everything just seems to be so difficult and such a struggle and as a result you begin to feel down and unhappy with your life. When things get like this, what you need is a radical change in your life, you need to (in the words of one of the greatest self esteem experts in the planet - Dr Joe Rubino) "Reinvent Yourself" in fact Dr Rubino's self esteem book might be just what you need to regain your self esteem and turn your life around. 10. Feeling of hopelessness and even depressed - This is again one of the low self esteem signs. Feeling hopeless and even depressed, and that could be due to many reasons, for example maybe you lost your job and have no income and the bills and debts are mounting up and you can't see a way out, that can create a feeling of hopelessness and depression. Usually when we feel this way, it's because we are too focused on the problem, there needs to be a change of focus from looking at the problem to looking for the way out. Rather than feeling hopeless, you have to get yourself together and realise that within you is the ability to turn around even the worst of situations in your favour. Remembering the story of people who have overcome great odds such as Nelson Mandela, can serve as inspiration when things get like this, after all, if he, after serving a life sentence could come out of prison and become the president of south Africa, that is a testament to the human spirit, the same spirit that is on the inside of you, that has the ability to overcome any obstacle if you don't allow it to be broken. Self esteem articles like this one, will also help to inspire you and help you get rid of that feeling of hopelessness and depression. 11. Can't handle criticism - The last of the low self esteem signs I want to highlight is that, when you have low self esteem, you find it difficult to take criticism. People with low self esteem see criticism as an attack on their person. Rather than seeing criticism as free consultation on ways they can improve and do better, they often take criticism in a very negative way and interpret it as being a failure and not good enough. To change this, you must begin to see criticism as feedback and free consultation on ways you can improve; making those changes might be what takes you from average to excellence and success. Self esteem expert, Dr Joe Rubino, has a great program for building self esteem. The program shows you how to get rid of these signs of low self esteem. Click here to take a look at Dr Joe Rubino's Ultimate Self Esteem Formula Program. Free Self Esteem Workbook - 8 Simple Steps to a High Self Esteem. Overcoming Low Self Esteem - Using the Power of Thoughts.